Couples in love can’t get enough of each other — especially when the couple isn’t physically together. One great way for lovers and couples to feel more connected is through matching accessories. We have already covered couple’s bracelets previously, now let’s take a look at some cool keychains. Looking for the perfect sweet, little gift to give to your special someone to show them how much they mean to you? 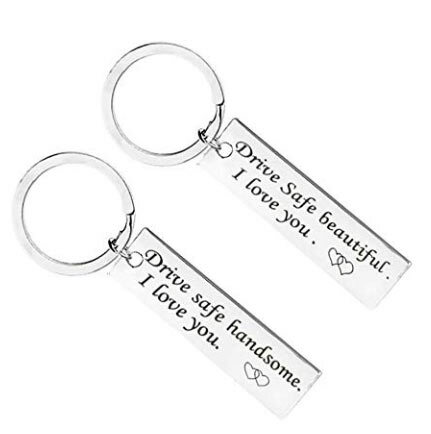 Look no further than these fabulous couple keychains. There are so many great options, you’ll struggle to pick just one! 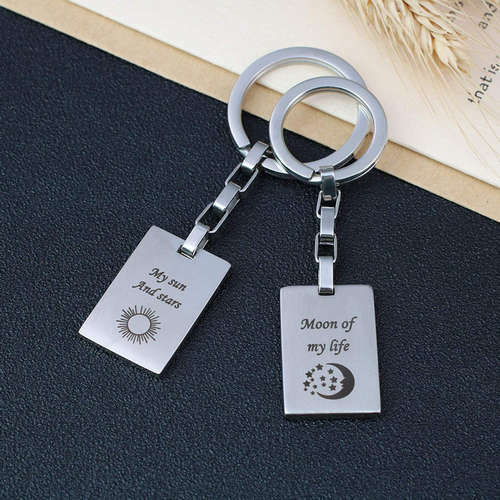 These keychains are perfect couple gift. Get them for yourself and your boyfriend, girlfriend, husband, wife or secret lover. They are ideal for your other half’s birthday, Christmas, Valentine’s Day, and just because. Did we mention that they are also excellent long-distance relationship gifts? 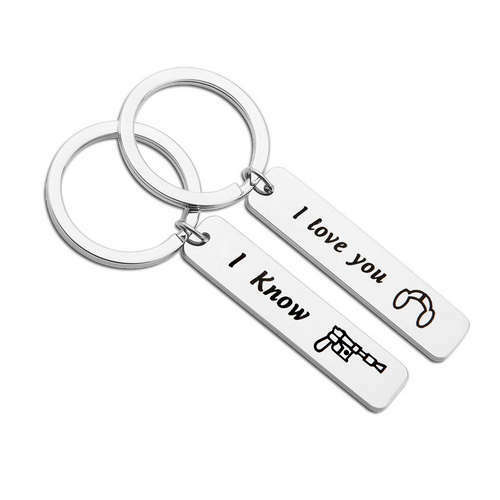 Sometimes it’s the little things that show just how much you mean to someone, which is why these matching keychains are so sweet. They’re the perfect reminder to drive carefully, as there’s someone special counting on you coming home. Are you both huge Harry Potter fans? This is the perfect give for your fellow Potterhead! Made with high-quality stainless steel, these Quidditch-themed keychains are the best way to tell your loved one that they’re a ‘keeper’. Is he your king? Is she your queen? Then you need these keychains! They’re durable and unique, ensuring they’ll remind you of your loved one for a long time to come. The gold crowns also add a bit of bling, and the contrast between the crowns and your keys will really make them stand out. If Star Wars is more your style, show your very own Han Solo how much you love them with this gloriously geeky keychain. Of course, they already know… But I’m sure they won’t mind being reminded! Avocados are definitely the food trend currently, and for good reason. They’re totally delicious! But did you realize they made adorable keychains too? Me neither! It’s no wonder, really, when each half hugs the other. 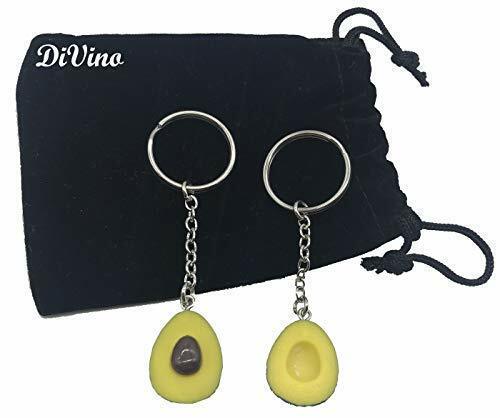 Let your partner know it’s time to avo-cuddle with these sweeties. If you’re cat people rather than dog people, these keychains have you covered. 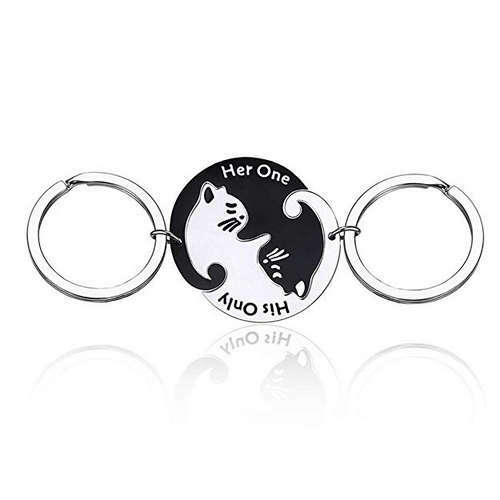 These sweet kitties are reminiscent of a yin yang symbol, whilst spelling out ‘Her One’ and ‘His Only’. They interlock purr-fectly, so they will always remind you of the person who has the other half, no matter how far apart you might be. 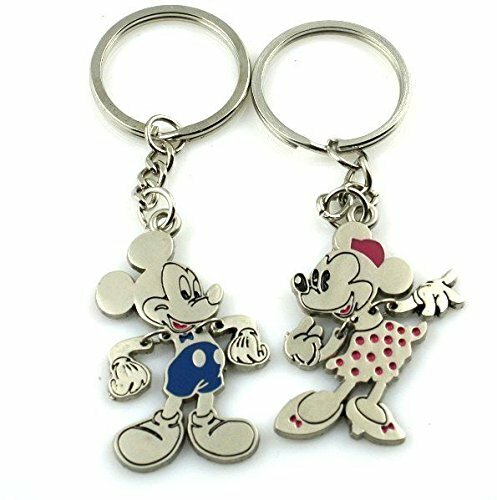 If you both have a soft spot for all things Disney, these Mickey and Minnie Mouse keychains are ideal. Each one features a sweet pop of color, and are the ideal way to compare your partnership with one of the cutest couples around! Couple keychains don’t get much chicer than these. These leather and gunmetal gray pendants are a gorgeous, understated way to show your love. 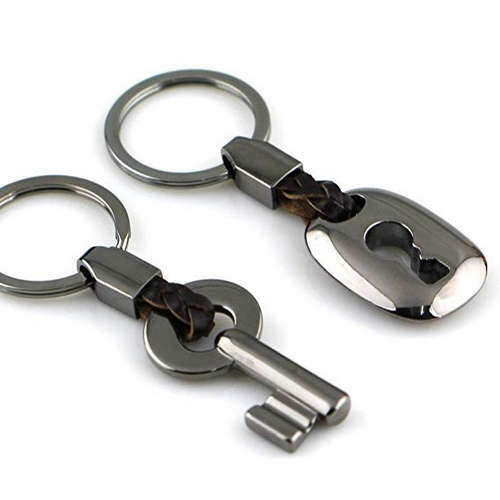 The key fits through the lock perfectly, and the stunning dark gray color stays untarnished for the life of your keychains. Win-win! 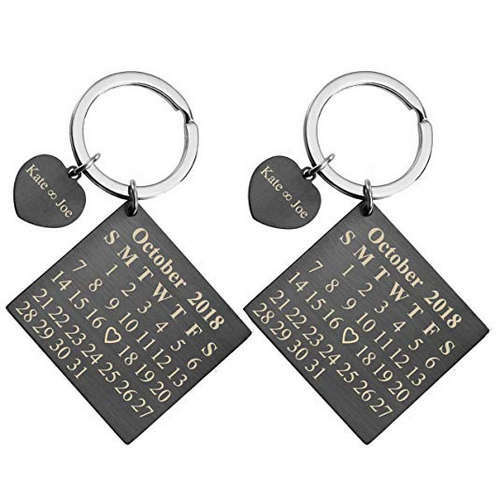 The possibilities are endless when it comes to the date you could highlight on these gorgeous calendar keychains. Your first date? First kiss? Wedding anniversary? Whichever date you choose, you’ll be reminded of the special moment every day when you pick up your keys. Cute AND practical? You got it! 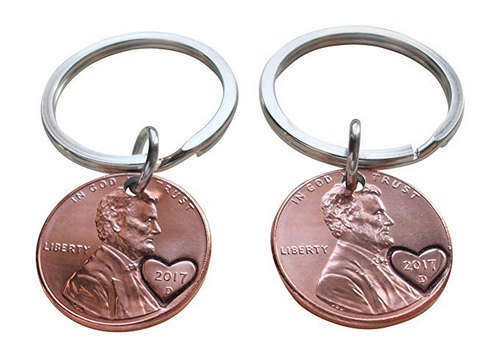 Not only are these girl-and-boy keychains super sweet, but they’ll also ensure you’re never stuck with an unopened drink again. After all, what better way to be reminded of your loved one than to use something they bought you every day? 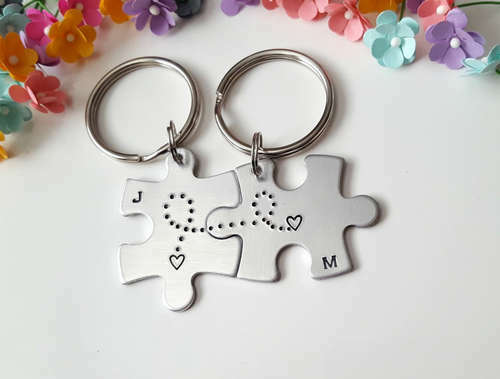 This too-cute couple keychain set features two puzzle pieces that fit together perfectly — representing you and your partner. No matter where you both are, they are guaranteed to remind you of your loved one. 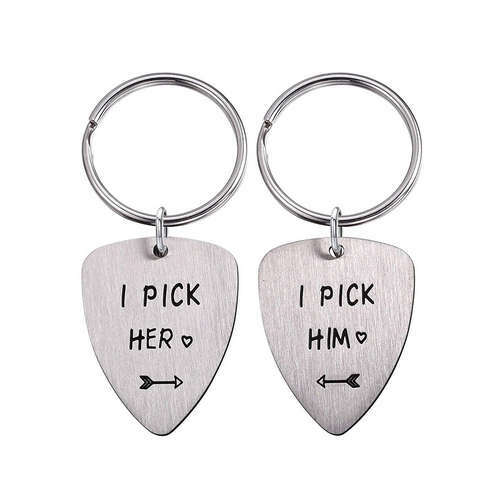 If the two of you have a shared love of music, these guitar pick keychains are ideal. Whether you play guitar or simply listen to music in your daily life, these couple keychains are sure to remind you of the person you ‘picked’. They’re silver-plated, meaning they’ll keep their shine and quality for years to come. I don’t know about you, but I am a huge peanut butter and jelly fan. If I received these couple keychains from my other half, I would be taking that as a huge compliment! It’s basically one of the best flavor combinations in the world just like you two are the best couple combination around! Have you two just moved in together? What better way to celebrate than with a special couple keychain for your new house keys? 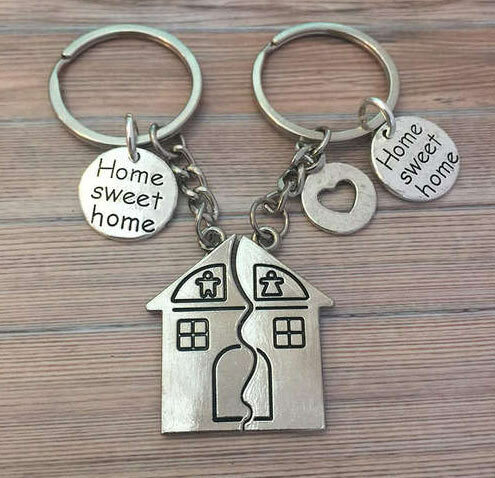 Each one features one half of a house, with the both of you inside, as well as a sweet engraving of ‘Home Sweet Home’. Too cute! 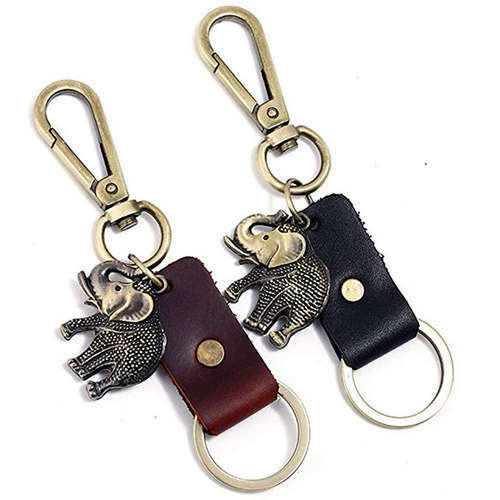 In the Hindu way of thought, elephants are thought to bring stability, honor and good luck making them such a good charm to carry with you on your keychain. These couple keychains also feature gorgeous leather, giving them a lovely bohemian feel. Was 2017 your year? Celebrate how important 2017 was for you two with these gorgeous stamped coin keychains. They come packaged with a cute card saying “what a lucky year!” which is obviously was, because you found each other. 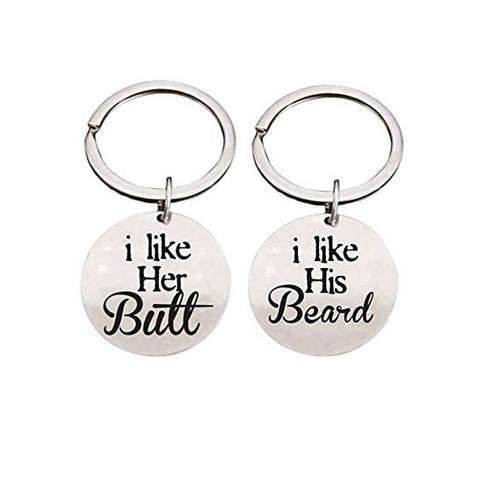 Get a little cheeky with these funny keychains! After all, it’s always nice to be reminded of your best assets. Every time you glance at your keychains you’re sure to smile how nice is that? ‘Love Me’ and ‘Choose Me’ – that’s what these too-cute-for-words piggy charms say on their little tummies. If that’s not cute enough, each pig has a magnet in its snout, drawing the two pendants together when they’re close to each other the perfect symbol for the love between you and your partner. 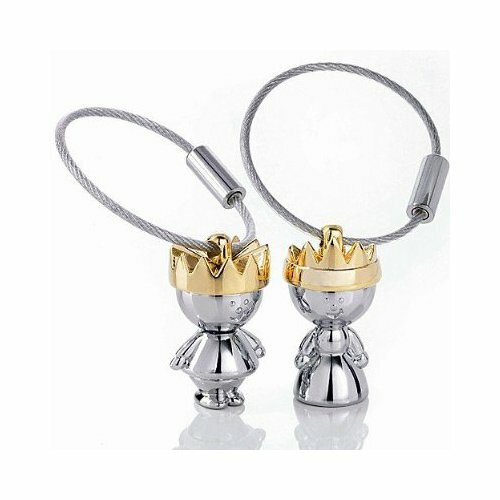 Look out Game of Thrones fans, we’ve found the perfect couple keychains for you! Featuring the phrase that Danaerys and Khal Drogo said to each other, these gorgeous laser-engraved pendants are perfect to share with your very own Dothraki love. 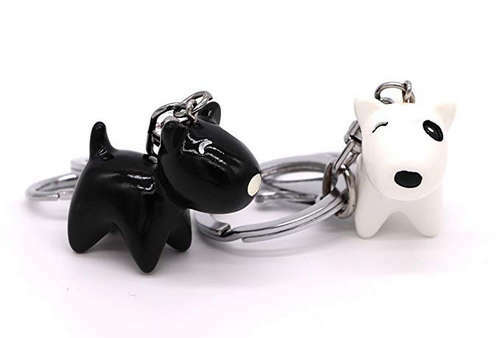 Did any of these couple keychains strike your fancy? I know it was hard to collate this list without wanting to buy them all. Let us know what you thought- we’d love to hear from you! Where To Buy These Keychains? Amazon has plenty of options available and they are really convenient to buy from. 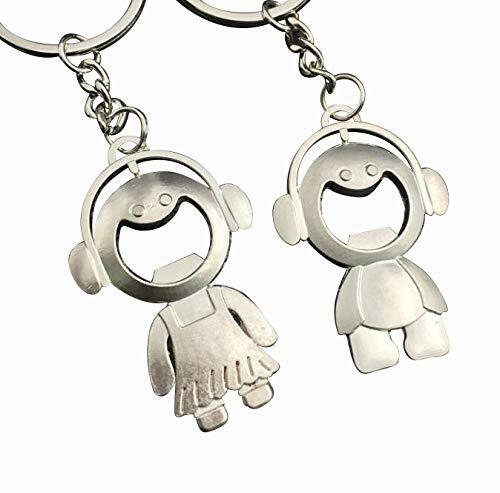 The couple’s keychains on Amazon are usually quite affordable, however, as most things are nowadays, they are often made in China. You can sometimes find awesome keychains on Target.com and Walmart but they are usually rare. Etsy is an awesome marketplace for this kind of products. Their products are usually handmade but some are manufactured in a factory so you’ll want to pay extra attention to the details. Anyway, be ready to pay a lot more if you buy from Etsy.